Vania Guerra’s story represents one of thousands of mothers who fight against the public authorities’ neglect and lack of accomplished professionals to deal with autism spectrum disorder (ASD), a range of conditions classified as neurodevelopmental disorders that do not have a cure. When Nicole, Vania’s oldest daughter, was diagnosed with autism at the age of three, there was not enough information on autism available in the United States. Vania experienced at that time the same feeling of impotence and lack of knowledge that many mothers experience when informed that their children fall within the spectrum. “Fifteen years ago, there was no information that could guide us. She was my first child and my husband and I just wanted her to be well. Since we couldn’t find answers here, we decided to go back to Brazil to have her checked and tested there. We stayed there with our daughter for nine months, and brought back to the U.S. the medical reports about her case,” explained Vania. According to Vania, from that point on, they fought for therapeutic help that could provide their daughter with a better quality of life, such as phono audiology and physiotherapy sessions. They also received several medications, and the dosages were increased by doctors after some time. “The medication had horrible side effects. My daughter was very aggressive, agitated. She had sleeping problems and she was not showing any improvement. She would remain locked in her own world and not interact with the rest of us,” Vania emphasized. According to Vania, since her daughter started taking natural medication as an alternative, many advances were easily detected, from behavior to even speech development. “Nicole’s improvement was fantastic. In two months, her changes with the medication were noticeable. Her doctor was impressed because he had followed her case for years and had no hope for improvement. Today, Nicole sits, plays and talks to her siblings, which didn’t happen before because she could not focus and was very agitated,” recalled her mother. Vania believes that the most important action is for parents to begin treatment as soon as they receive the diagnosis of autism so the child can have more opportunities to become independent in the future. World Autism Awareness Day (WAAD), celebrated each year on April 2, was adopted by the United Nations in 2007, but the whole month, called Light It Up Blue, is dedicated to the cause. According to the UN, about one percent of the world population – one out of 68 children – shows some form of autism spectrum disorder. In celebration of Light It Up Blue day, thousands of monuments and iconic buildings join hundreds of homes and communities around the world to shine a “blue light” in support of all people within the spectrum. With that in mind, on April 10, the event “Light Up City Hall Blue” was held at the Danbury City Hall in support of the cause. Mayor Mark D. Boughton reminded attendees that Danbury is a community and that we are here to encourage and strengthen each other. The international community has embraced the work to increase participation and social awareness by providing people with more information about autism. According to Vera Santana, mother of an autistic child, the event helped bring knowledge about the reality of the life of a child within the spectrum. “As parents, we always want what is best for our children, and we are faced with concerns and challenges. I truly believe that awareness about the subject is extremely important so other parents can be encouraged to fight for their children. Many times, prejudice and lack of acceptance of the diagnosis can compromise the child’s development,” said Santana. Geania Farias believes that the event is a good way to show families that they are not alone and that it is comforting to find out that more people are fighting for the same cause. 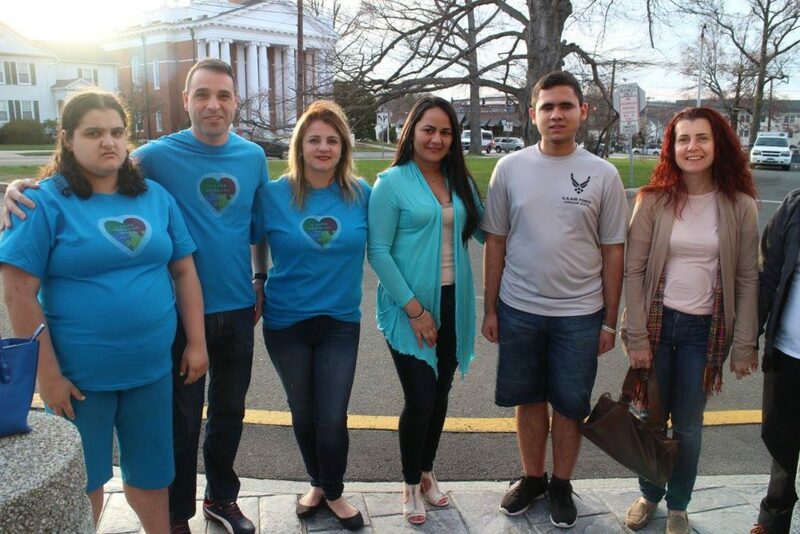 In addition, there is a group of Brazilian mothers in Danbury that meet regularly to exchange information and tips on autism disorder. The main goal is to prevent children from becoming more isolated and losing their ability to communicate and interact with society. Those who are interested in participating in the group should please contact Vania Guerra at 203- 648-2512.